We offer Friday to Monday (long weekends), Monday to Friday (midweek breaks) or full weeks starting either Mondays for Fridays. Shorter breaks or different changeover days may be considered - please enquire with details. Note that quotes automatically generated by the HomeAway website for these will not be correct. If we do not have availability for your dates, you may be interested in our sister cottage The Lodge, which is very similar in terms of quality and facilities. Please visit www.thelodgemorfanefyn.co.uk for more details. This former 19th century boathouse, fully renovated in 2008, is situated in the popular yet unspoilt seaside village of Morfa Nefyn on the beautiful Lleyn Peninsula. Enjoying mountain views from the rear, it is in walking distance of the picturesque beach and the coastal path leading to historic Porth Dinllaen and the renowned golf course. The luxury and stylish accommodation provides 3 bedrooms, 1 bathroom, 1 shower room and a bright open plan kitchen, dining and living area, with double height ceiling and a wood burning stove. Features include hardwood floors, a mezzanine with original exposed beams and modern appliances, including dishwasher, flatscreen digital television with netflix and Nintendo Wii. The property benefits from full gas central heating, instant hot water and a powerful walk in shower.We offer free unlimited wifi. Guests are also welcome to use our beach hut on Nefyn Beach in the summer. From summer 2017 we have an outdoor barrel sauna for guests to use. Slate tiled main bathroom with exposed original beams. Wet room with large walk in powerful shower behind glass screen. Instant continuous hot water. Portable hot tub suitable for 4 people available on request. Flat screen digital TV with Freeview and Netflix. Mezzanine area overlooking lounge area, with original exposed beams - normally used as play area (Nintendo Wii provided) or spare guest sleeping area (foam sofa bed provided). Separate utility room with washing machine, tumble drier and second (drinks) fridge. Ideal for hanging and drying wet suits or walking gear. Free unlimited wifi access Very efficient and cosy wood burning stove in lounge area (the subject of many positive comments from previous guests). Electric car charging point. Sarah is an amazing host and the cottage is beautiful, full of lovely touches. We had a great time here and we cannot wait to return. Even in the high winds it was lovely to just sit around playing the games provided. Thank you for everything. Boom Cottage has been renovated to a very high standard, with careful consideration of the needs and comfort of potential visitors. The howls of Storm Callum outside deterred our party from venturing to the sauna, but made the central heating, supplemented by a log burning stove (plentifully supplied with fuel) doubly welcome. The mezzanine play area above the spacious living room was frequented by young and not-so-young alike. With excellent communication from the proprietor, and a generous complimentary bottle of fine wine, we were made to feel welcome. The cottage is spotlessly clean and as very frequent visitors to the area, we will definitely return. Fantastic cottage, close to the beach and has everything you need for your stay. Would be happy to stay here again and would also consider the other cottage they own around the corner. Had a relaxing comfortable week in a lovely property. Everything was fine, plenty of room for 7 of us without being on top of each other. Great isolated location, sauna a pleasant experience, the only negative would be the state of the BBQ.. unusable, so had to buy disposable. Thanks for your review. We were made aware of the state of the BBQ (which looked like it had been run over!!.. don't know how that happened!) after your visit and have now replaced it with a new one. We do encourage guests to let us know of any issues during their visit - we would have had a new one delivered straight away for you to use. 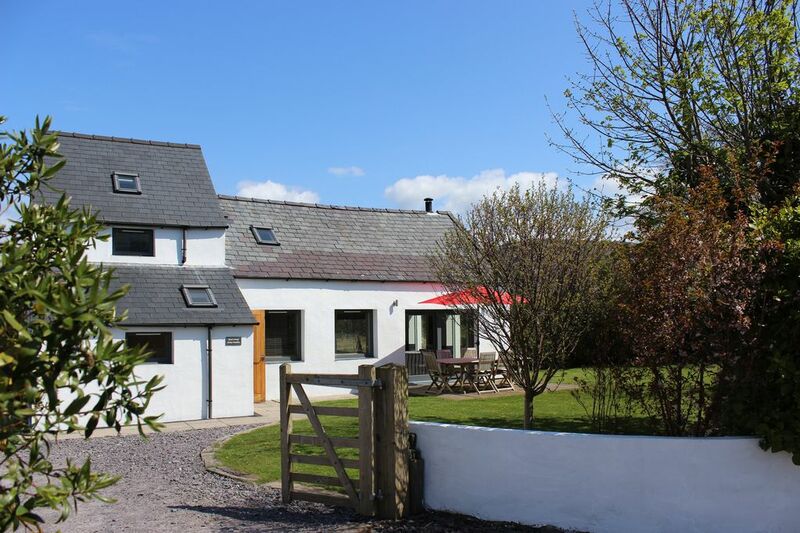 Boom Cottage is located in the small seaside village of Morfa Nefyn on the Llyn Peninsula, close to a large selection of beautiful beaches and coastal walks. Short walk to the beach at Morfa Nefyn and the scenic walk to the Ty Coch Pub at the far end of the beach. The cottage is less than a mile from the renowned 27 hole Nefyn & District golf course with stunning sea views from every hole. We have negotiated a 10% discount on green fees for guest staying at Boom Cottage. Seaside town of Pwlhelli is 6 miles away. Close to Abersoch where there is a large selection of shops, bars and restaurants, and sailing schools. Changeover days are Fridays and Mondays. We offer full weeks (Friday to Friday or Monday to Monday), midweek breaks (Monday to Friday) or long weekend breaks (Friday to Monday) Please note that the nightly prices above refer to 3 night weekend breaks and 4 night mid-week breaks. We may consider shorter breaks (eg 3 night midweek) but the price will NOT simply be the pro-rata nightly rate. STRICTLY NO HEN PARTIES, STAG PARTIES OR GROUPS OF UNDER 25 YEAR OLDS PERMITTED.